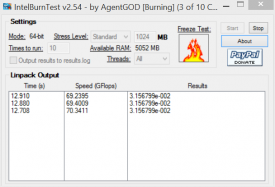 "Intel Burn Test is a light weight tool that simplifies the use of Intel’s Linpack and tests overclock stability." Intel Burn Test simplifies the use of Intel’s Linpack benchmarking program by providing a simple and accessible user interface. Test the stability of your new overclock and make sure that your computer will not crash during the most intensive of times when you use your computer. 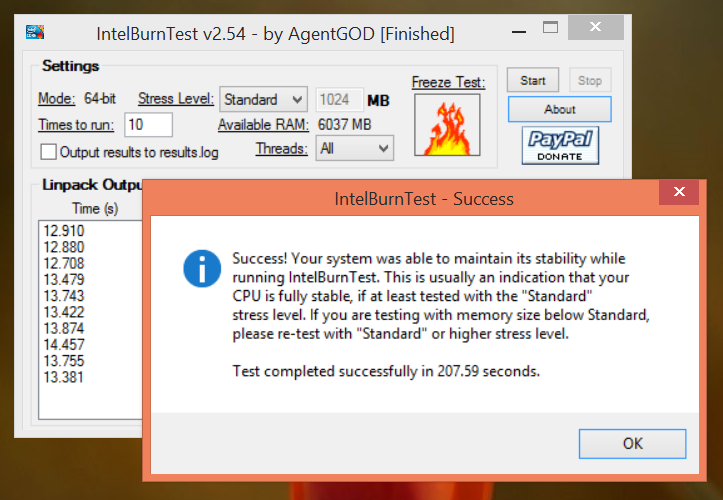 It is best to test that your computer is stable before doing anything important, and the Intel Burn Test will do this for you with relative ease. There’s no collage of menus to navigate through to get to what you’re looking for. Everything is right there at the main screen including your choices of stress level, number of threads, times to run, and the ability to output a log file of your results. With simplicity at your finger tips, you are a few clicks away from starting an intensive test to check the stability of your personal computer. 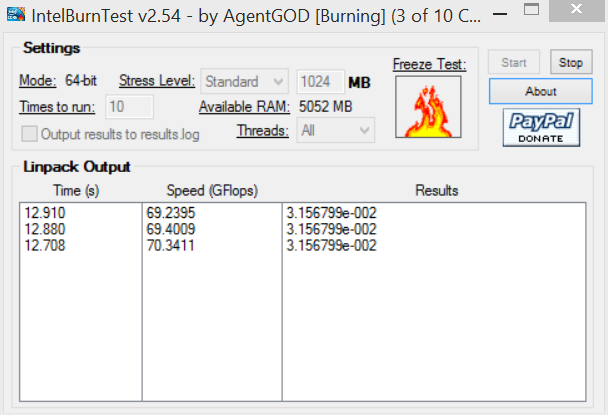 Although Intel Burn Test lacks some of the feature that other benchmarking programs have – such as dynamically creating graphs during the test – it is a very quick, easy, and efficient tool to use. Even without these features, the application will still test your computer and make sure that you are aware if your new clock settings are stable enough to do even the most complex work. Intel Burn Test is extremely stressful on your CPU. It is highly recommended that you utilize a cooling agent when performing your tests. Not doing so can lead to overheating your CPU and damage it. Make sure you only use this application if you already have some experience with stress testing and overclocking your computer. If this is your first time, make sure you have done extensive research on what you need to do to safely overclock and test your computer.